Your grass needs to be mowed frequently and at the proper height. Here at Olson's Lawnscape we recommend mowing your lawn on a weekly schedule. By mowing weekly you will keep your lawn looking great during the mowing season but, make sure you follow the 1/3 rule. The 1/3 rule is to not cut more than 1/3 the height of the grass at a time. For example if you like your lawn to be 2 inches tall then it needs to be cut once it is about 3 inches in length. We also recommend mulching your clippings which does not cause thatch build up if you are following the 1/3 rule and also has the added benefit of returning nutrients back to the soil to naturally fertilize your lawn. For the best results don't water your lawn the day you are mowing and change the direction you are mowing each week. In addition to mowing your lawn, proper edging around all concrete surfaces using a steel blade edger and line trimming around your home, fence, flowerbeds, trees and other obstacles in the yard will make your yard look like a pro takes care of it for you. Even if your lawn is being mowed once a week, if your landscaping is not properly cared for it will impact the overall curb appeal of your property. A proper bush trimming and ornamental tree maintenance schedule will not only keep your plants healthy but will also give your home a very well kept appearance. Trimming plants and bushes properly is important to their health so if you are not familiar with the proper care for the plants on your property it is best to do some research to determine how to properly care for them. But there is more to having a great looking landscape than just mowing the yard and trimming the bushes, one of the biggest impacts on landscaping is having a weed free flowerbed with beautiful fresh mulch installed. Bending over to pull weeds and carrying bags or wheelbarrows of mulch is demanding work, so depending on the size of your flowerbed project you might consider letting the pros at Olson's Lawnscape do this back breaking work. Whether you decide to tackle this job yourself or hire the pros to do it, your landscape will look better immediately after finishing the project. Mowing your lawn frequently and maintaining your landscape just isn't enough if you want to have beautiful yard. Just like any living thing having an appropriate diet is essential to the long term health and fitness of your lawn. You will need to have a feeding and weed control regimen that will benefit your lawn and should include granular fertilizers, liquid fertilizers, pre-emergent weed control, post-emergent weed control and should also include a pest control solution for your lawn. Proper fertilization and weed control is what will set your lawn apart for the rest and will make all of your neighbors green with envy. But in addition to having jealous neighbors it will also make your weekly lawn mowing easier as lawn mowers are designed to mow grass, not weeds. Weeds rob your grass of nutrients and water, so by getting rid of the weeds your lawn will not only look better but will also be healthier. 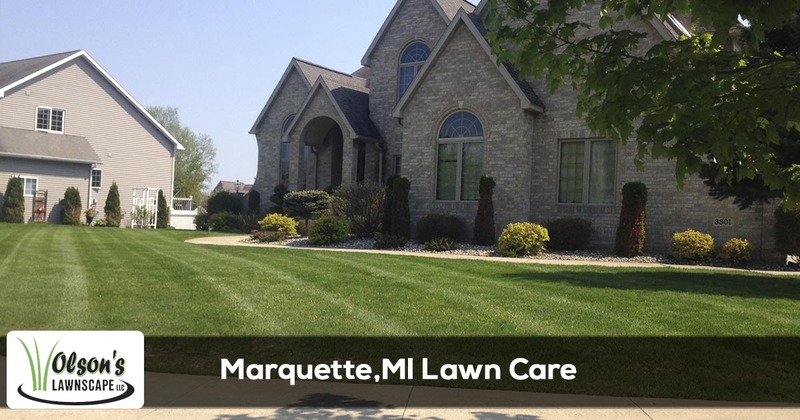 There is a lot of work that goes into having a beautiful lawn and landscape, if you would rather spend your weekends enjoying your Marquette, MI lawn instead of laboring over it give our Olson's Lawnscape Marquette location a call at 906-233-7325. We offer all the lawn care services you would need including lawn mowing, fertilization & weed control, landscape maintenance, outdoor pest control and once the snow starts to fall we even offer snow plowing and removal services.